It is a virtual art gallery, a web site, that was created in October of 1998 by Worcester Massachusetts artist John Pascarelli. "My goal is to give New England visual artists an alternative, free place to display their artwork. Artists are not charged a fee to display their work, and Pascarelli Gallery does not take a percentage when an artist sells a work. As a matter of fact I do not get involved in the selling of the artwork at all. I display images of the art along with customer contact information provided by the artist which will be displayed in the Artists Information page." You, as an artist, should have the original copyright to all the artworks that you create. While your art is being displayed in Pascarelli Gallery you still hold all the copyrights to your work. However, I can not know if you sold the rights to certain artworks at some point. That is why I have you sign the Pascarelli Gallery Display request form stating that you own the copyright to your artwork. I do not wish to infringe on anyone's copyright. Also, I have displayed the Copyright symbol © on each page of the gallery. This is to protect all of our rights as artists. As you know the Internet is not secure. Individuals will be able to copy your work if they want to. I have placed a right click dysfunction on each page to try and discourage this, but it is not foolproof. Also, I have placed copyright information with the individual artist's name inside the properties of each image file. All the music that you hear in Pascarelli Gallery was written, and performed by John Pascarelli. The songs are short loops from music that was either made specifically for the site, as was the "Home Page Theme," or taken from the many songs that he has created through the years. On the "Featured Artists" page you are hearing a bit of a song titled "Tijuana Sass." On the "Links" page you are hearing a short untitled solo piano melody that was made just for the page. The "Media" page sports the beginning bass line, and piano to a song called "1975." When your viewing the Display Request Form you are listening to "Errand." And what you are listening to now, if you have not turned the volume down yet, is a few seconds of a song called "Jogging With Jesus." John does not play a musical instrument other than a computer software MIDI Keyboard that simulates a piano keyboard. The beautiful thing about MIDI is that you can make the sound of virtually any musical instrument that you wish. The individual instrument parts are then recorded, overlapped, and pasted together in a audio editor to create an entire song. 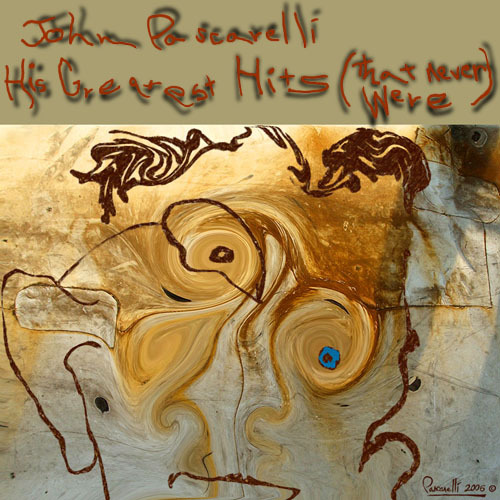 You can listen to all the songs from the Pascarelli Gallery web site in their entirety, plus many more, by ordering John's CD titled "His Greatest Hits That Never Were." It is a compilation of songs from his first two CDs "American Dreamer," and "20th Century Boy," plus many new songs, and is over 60 minutes of odd, mostly instrumental musical improvisation. $10.00 for the CD. Postage included. You can order it through e-mail by clicking here.